Alyssum Basket of Gold Aurinia Saxatilis is a low-growing, evergreen perennial. Also called Yellow Alyssum and Gold Alyssum this compact ground cover is easy to grow from Alyssum seeds. Gold Alyssum produces dazzling, fragrant clusters of golden-yellow florets that attract masses of butterflies and bees. After bloom time is over, Gold Alyssum continues to make a wonderful ground cover by showing its attractive, silver-green foliage. Alyssum Basket of Gold looks amazing in rock gardens sprawling over rocks or cascading down rock walls and making a colorful ground cover along borders. 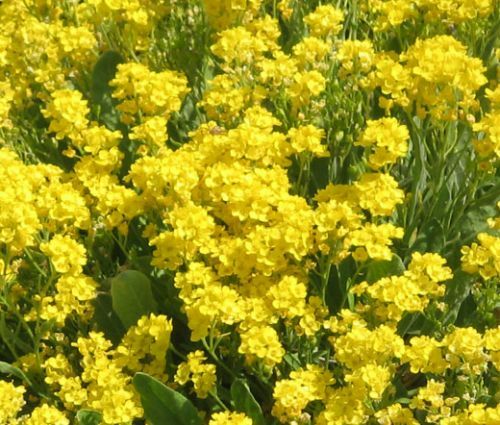 After sowing Alyssum seed, adequate moisture must be maintained, but once Alyssum Basket of Gold is established, it is drought tolerant. Aurinia Saxatilis re-seeds itself freely, so every year it spreads more and more by simply multiplying itself.